I am writing about this book in the blog today as we all heal from the losses suffered on many levels in Charleston, South Carolina last week. We may have known a person killed, experienced great loss as a church member ourselves and/or been shaken by the intrusion into the safe place of a church. Possibly a previous loss in our lives was triggered by the murders, or violence we have suffered or our loved ones have suffered was brought to the fore. We grieve. We process and we may be overwhelmed by emotions, memories, body sensations or maybe by nothing. Some may experience nothing that manifests as emptiness or numbing. These are all normal responses to loss, bereavement and sadness. 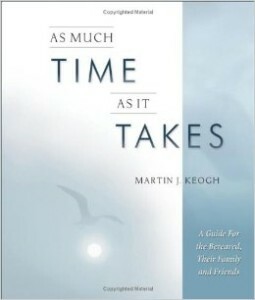 Martin Keogh is a giant of a gentle person and an artist. He has pulled together in this book tools from his own experiences of coping with losses and healing in a state of bereavement. He words are skillfully comforting as well as sometimes boisterous with laughter. I have had this book for a long time and it has helped me in various ways. Martin’s wife Liza was my yoga teacher in Brockton, Massachusetts. I pulled this little book out this weekend and am finding the writings, poems and stories very helpful. There is solace in the pages as we struggle to comprehend the losses to the community in Charleston and in our country; losses of leaders, trust and safety on the macro level and all the personal losses as well as the possibility of triggers that bring up our own history of losses and how we managed them. For more information on Martin Keogh, or to purchase his books, click here to visit his website.